This is one of those movies I'm not even sure I should've been allowed to see let alone review...but it's available on Amazon and iTunes so I'll have good company in jail. For, as I type this, I keep waiting for the door to bust open and the A-Team to file in complete with Mr. T and all his gold chains and--c'mon, let's face it-- as a polite, native midwesterner who trips and apologizes to the sidewalk, I will fold under questioning and confess to crimes I never committed like perhaps marooning all those islanders on Lost which I've never even seen. Yet, I'm glad I was somehow deemed hip enough (and Erik, thank you, my man) to review this fascinating documentary from The Disinformation Company which has released some other high quality works that the Hollywood mainstream simply doesn't want you to see such as Michael Moore's Slacker Uprising (aka the first movie I saw on my Netflix Roku device), as well as Robert Greenwald's brilliant duo Wal-Mart: The High Cost of Low Price and Outfoxed: Rupert Murdoch's War on Journalism which I discovered as an undergraduate film student. 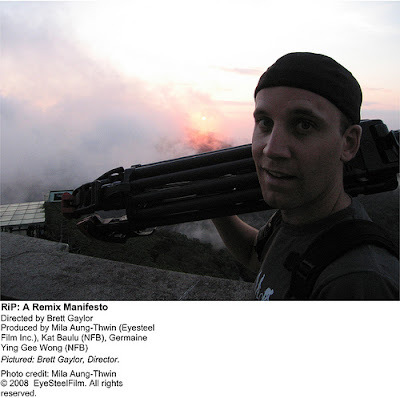 Crafted by a likable and highly energetic yet cautious filmmaker who ensures he never steps on the toes of those he interviews or goes for cheap shots-- Brett Gaylor walks his talk by releasing the film in its entirety completely in open source and DRM free both on the DVD and online via his website. Born and raised during the dawn and evolution of the internet on a tiny island off the enormous mainland of Canada-- originally he found the world wide web to be a tremendous outlet which allowed him the immediate and unlimited ability to connect with the planet at large. Yet right around 1998, Gaylor began noticing amidst the era of Shawn Fanning's Napster debacle which kick-started peer-to-peer file sharing and the endless copyright lawsuits that followed-- that suddenly ideas and online creativity were becoming less free and more likely to get you fined, find you without a home, or forced into a squad car. Further problems ensued, however as the entertainment industry realized that consumers then had the power over the content they'd created to do with what they wished. Of course, that was until they created new red tape in the form of greater rights and fine print for the ownership of content possessed by essentially six major corporations along with of course creating a new lock with "DRM" a.k.a. digital rights management or corporate software which prevented you from adding or ripping the files of a film or album onto your computer. Yet, when there's a will, there's a way so cyber pirates provided their own key with "vault cracking DRM software" which can land someone five years in the slammer and/or $250,000 for every song they've downloaded. Now in an era where there have been lawsuits levied against 24,000 Americans who've been forced to settle without guilty pleas even though not a penny of their fine goes to the artists, musicians or filmmakers whose work they've downloaded-- Gaylor has taken a keen interest. And with this film, he's decided to look at all of it but in an upbeat, fast-paced, humorous way by taking a particular interest in those who have been fighting against the hypocrisy with creativity as their weapon of choice. In doing so, he cites that remixing has always been practiced since Led Zeppelin took Muddy Waters' "You Need Love" (which actually had come from somewhere else) for "Whole Lotta Love" in the same manner that The Rolling Stones and others have done again and again although of course The Stones sewed Verve for full rights to "Bittersweet Symphony" and sold 'em to a Nike Commercial. Yep, that's just what The Verve meant in the lyrics when they wrote, "you're a slave to money then you die." Yet, while musicians have always enjoyed "sampling" or remixing each other's notes, as we learn just moments into the movie-- taking even a single note and using it in your work is a copyright infringement issue, which is a major problem for Greg Gillis a.k.a. Girl Talk who works as a biomedical engineer from nine to five. Yet whether or not there's a full moon-- at night he's out on the prowl-- like Clark Kent changing into a booth, the nerdy scientist becomes music's hottest underground mash-up Superman mixing together old Motown classics with Elvis Costello with "Bittersweet Symphony" or whatever music is exploding on the Rolling Stone magazine charts that week. 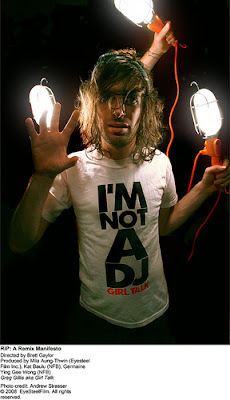 By sampling 21 songs in 3 minutes, Gaylor argues that if Girl Talk were to make an album, he would owe roughly 4 million dollars in copyright fees for the music he samples and it's fun to watch Marybeth Peters-- an employee at the Office of Copyright who's held the position for 40 years (yet doesn't own a computer in her home) watch footage of Girl Talk sampling one note of a Costello song before her eyes to see the mathematical complexity involved. Of course she's indeed correct when she notes that you can't argue that the copyright law is hindering someone's creativity if it's based on other people's stuff (and I do think Girl Talk is so gifted that he could probably create his own) but then when you realize the amount of greed involved as Warner Chappell Records makes millions every year on "Happy Birthday" and not a cent in royalties goes to the family of the deceased sisters who wrote it, you wonder if some stuff really should belong "to the people." And this is especially the case considering that Warner Brothers-- incidentally, one of my very favorite studios!-- has made a mash-up of their own classic work Casablanca and turned it into an anti-piracy ad, thereby ruining one of the best American films of all time for future generations by presenting the next generation with the image of Ingrid Bergman as a DVD copier along with cheesy music instead of "As Time Goes By." 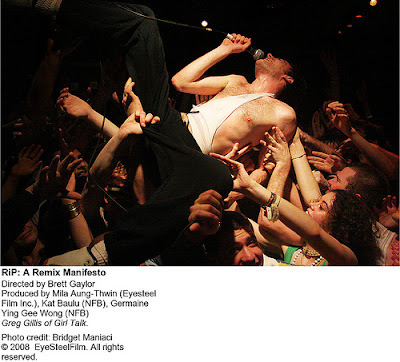 Essentially, the thesis for Girl Talk as an artist and indeed Gaylor's film is simple and it is that basically remixed content turns the consumers into creators; so Gaylor divides his film into those on both sides of his argument of the "copyRIGHT and the copyLEFT." 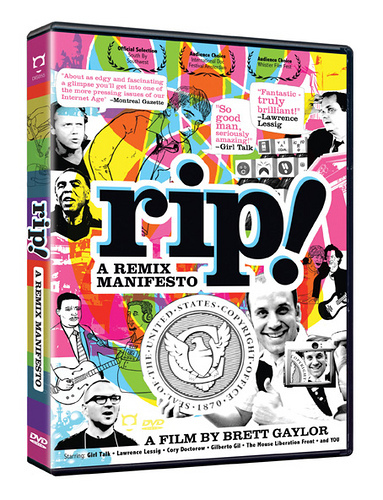 In tackling mash-ups which also involve video to often hilarious effect as you've seen on YouTube (typically before they're pulled down for copyright violation) or via the ninety extra minutes of footage on this DVD and within the disc that include such state-of-the-art techniques as rotoscoping), Gaylor's journey takes him from Girl Talk who will become legitimately appreciated by the film's end earning a fan in Paris Hilton and performing at Coachella to meeting up with Stanford professor, lawyer and expert Lawrence Lessig. In addressing the way that the past still has control, Gaylor becomes a member of a group called the Mouse Liberation Front who were sued by Walt Disney Corporation for their "Air Pirates" line of funnies or comics by turning Mickey into a counterculture, darker figure and during this interview wherein the man he speaks with jokes that the house of mouse will sue everybody just for looking at 'em. Moreover, he discusses the origins of the Disney animation studios and Walt Disney's first efforts in particular by noting the way that Mickey Mouse was often drawn in shorts to tie in with pop-culture like Buster Keaton's Steamboat Bill Jr. or Charlie Chaplin's Modern Times all the way up through their renditions of the classic fairy tales remade again and again, noting that Disney himself was a mash-up artist. 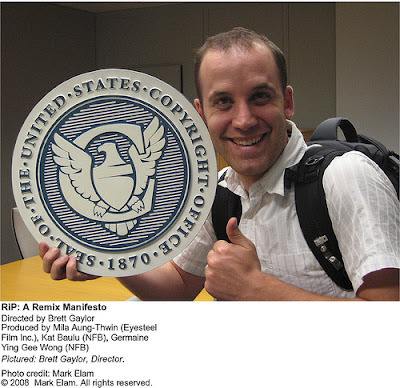 Briefly addressing some of the new strategies to counter the copyright sledgehammer and the big house such as "fair use for free speech" or "creative commons" or "citing sources," there are two portions of Gaylor's documentary that are almost deserving of their own spin-off works in their own right, including the first when he discusses the amount of potential medical cures that could be found if drug companies worked together and why or how it is lawful for some to own plants or land with potential healing powers. Secondly, in a great segment, we meet the former Brazilian Minister of Culture Gilberto Gil when Gaylor travels to Brazil by investigating the way that medicine, music, art, culture, and more are all used without fear of "idea ownership" to better their society in a chain reaction of positivity where the country bravely "re-mixed" their own knock-off HIV drug when Brazil wasn't allowed to "break the patent" to help their citizens. These last few portions of the film have an amazing impact on a larger social issue scale concerning health, safety and foreign policy and while they definitely go in tandem with the arts and culture angle-- I was so riveted by Gaylor's findings that I almost felt like he may have had enough for two films or even a few very hard-hitting short subjects works. But nonetheless-- RiP! 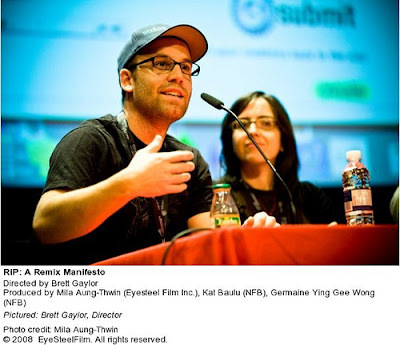 A Remix Manifestio is a film festival favorite, crowd-pleasing, and conversation provoking documentary that was so immediately gripping I had to share it with others of all generations since even at roughly thirty, although the term "remix" was definitely familiar; "mash-up" just made me think of "Monster Mash" or the mash games played by kids in the '80s on school buses. And in the end, Gaylor has made a stunning work that's not only the most entertaining presentation about the copyright issue that's come down the line so far but also one that's so filled with extras, pulsating with the music of Girl Talk that it's energy is infectious. Likewise, its impact is startlingly immediate like a jolt of caffeine or the instant gratification of downloading something awesome like Radiohead's "pay what you want" release of In Rainbows.